Buckwheat on one side, Millet on the other! 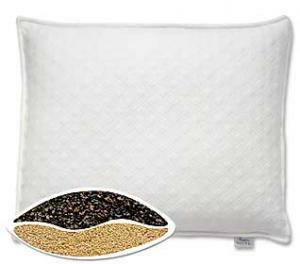 Ingenious double-sided design gives you the best of our two natural fillings in one luxurious bed pillow. Buckwheat for cool, stable support. Millet for dense, silky softness. Too full? Just unzip and remove some filling. Comes with a pure white pillow case in elegant quilted knit fabric. Washable cover. Packaging is a useful vinyl tote-great for storage, shopping, or going to the beach! Now available in Small 14"x11" 4lbs. 8oz, and Standard 15"x20" 8 lbs 4 oz.